The Opposition Opinion – Everton (H) – “We’re almost just going through the motions at this stage” – NUFC blog – Newcastle United blog – NUFC Fixtures, News and Forum. 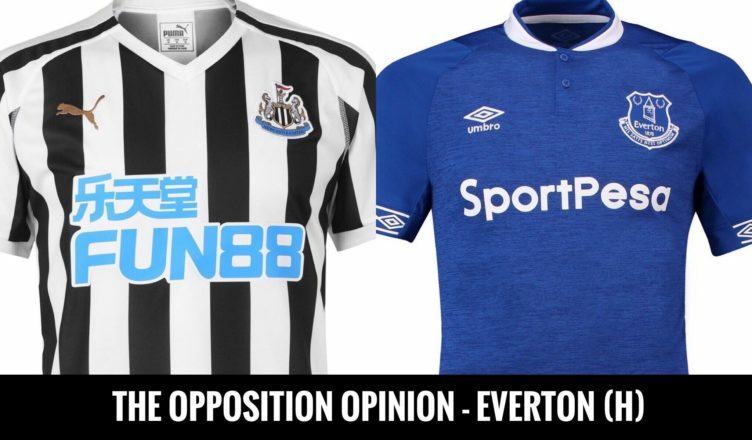 For this week’s Opposition Opinion piece, we’ve been speaking to Everton fan Will Proud (@ProudWill) for the second time this season ahead of this afternoon’s game at St James’ Park. 1) When we last spoke before our game with you at Goodison in December, you were 6th in the table and looking in good shape. A few months on and you’re now as close to us in 14th (6 points) as you are to Wolves in 7th (a position you had made your own not so long ago). Just what is going on with Everton at the minute? From the outside looking in, you don’t seem to be performing like a team that’s had well over £200m spent on it over the past 2 seasons..
“After the first derby a lot was made about our results. We went a poor run that included particularly disappointing results against Brighton, Southampton and recently Watford. “Since our last game we’ve lost matches against those teams around us which has made our task of finishing 7th – which had to have been mine and most Everton fans’ expectations for the season – a lot harder. I believe we should have been in a position where 7th was pretty much nailed on, especially since Wolves have dropped a few unexpected points recently, and in the best position to capitalise on any slip ups from sky’s ‘big 6’. “There appears to be a lot of uncertainty about Marco Silva, with many believing he doesn’t have the pedigree to take Everton where we need to go. Last weeks performance will have done a lot to help restore faith in him, he’s been accused of being too stubborn regarding his tactics. His recent inclusion of Schneiderlin has seen somewhat a shift to being a little more conservative at the back. For example, Pickford wasn’t passing it out to his back 3,4,5 as frequently against Liverpool. I would imagine against a less offensively intense opposition like yourself, Andre Gomes will come back in and we will see a more expansive Everton. “Unfortunately, I believe that we are almost just going through the motions at this stage with 7th going to be a push and relegation is not really a concern. We are waiting for the summer and hoping for another cash injection. 2) You were coming off the back of devastating last minute defeat at Anfield when we played you earlier this season. Saturday’s game sees you play us straight after another Merseyside derby, but this time you arrive after picking up a good point – especially when it stopped the reds from going back to the top! Do you think the occasion of last weekend’s derby and the result gained will help or hinder you ahead of your trip up to St James’? “I think it will ultimately help. Goodison was as lively as it has been all season on Sunday and I can see that continuing with the team against you. “Yes, Sunday was an excellent point for us and the performance was filled with positives. I think Richarlison and Gomes will come in for Walcott and Schniderlin and we will come into the game with what I think is our full strength team. 3) What have you made of Newcastle this season and which players do you see as the strengths AND weaknesses in our current side? Anyone you’re wary of and anyone you you don’t rate or feel you can exploit in this one? “Strengths – Defensively you’ve been compact and well organised under Benitez. But now you also appear to have more capable defenders or at least inform defenders. “Dubravka is your biggest strength and best player for my money. He’s appears to have been an excellent piece of business. It would be a real shame that players like him won’t be signed if Ashley got his way and went back to the Under 25 purchasing policy. “Weaknesses – If we can successfully choke the supply to Rondon, which in all fairness we struggled with at Goodison, we would be able to stop nearly all of your attacking threat. “Your midfield doesn’t strike me as too creative, certainly nothing that I wouldn’t expect for Gueye and Gomes to be able to handle. If our full backs push back your wingers and leave Rondon isolate then I think you’ll have problems creating. In which case things will depend on our ability to score which I think we will do. 4) Which players do you see as the strengths and weaknesses in this Everton side? Also, are there any ‘ones to watch’ we should know about (for good or for bad) that us NUFC fans may not know too much about? “Strengths – We’ve got more ‘match winners’ in our squad than I can remember in a long time. Hopefully our front 4 will be the very dynamic Richarlison, Sigurdsson, Bernard and Calvert-Lewin. Less so Calvert-Lewin but the other 3 certainly are capable of a moment of magic at any point which is exciting for us – although it hasn’t happened enough of late. Walcott must be dropped! He’s been awful recently. “Weakness – Our weaknesses have been well documented of late. Set pieces are clearly an issue for Silva and his Everton side appear to be no different. Whilst Keane, Zouma, Richarlison, Calvert-Lewin and Gomes do offer a degree of height we still struggle. Zonal marking doesn’t work and providing there’s a decent service, we can concede to set pieces. Last time round I remember Ki playing some excellent dead balls. There’s potential for this to worry me and regardless of how well our defence does in open play, it can be a method of conceding. 5) What sort of game do you think it’ll be and how do you see it panning out? Score prediction? “As I’ve said previously, low scoring. 1-1 or 1-2 if we manage to sneak it. I can’t imagine we would keep a clean sheet. “Your recent shift in style to bring the best out of the new lad that no f**** has ever heard of but you rim like he’s Messi (you can add his real name I suppose) has led to more goals and it will almost certainly be enough to score against us, if not from there then from a set piece. 6) Unfortunately, Sean Longstaff has been ruled out of this one and it looks like his season is over after a posterior knee ligament injury, but what have you made of Sean Longstaff’s emergence? “I saw him when we went to your pre season against Hull and I was impressed. “He appears to have a lot of good physical traits which is vital for young players to make an impact in the Premier League. He’s good on the ball and has a decent range of passing too. “I think feet need to be kept firmly on the ground. It would be a concern if he started believing his own hype. I don’t know enough about his personality to make any real judgement about that though. “I hope for his sake and yours that he has the necessary mindset to make it and convert a decent start into being a consistent player for Newcastle and potential England if the hype is to be believed. 7) Speaking hypothetically, who would you go for and why if you could sign any TWO Newcastle players for Everton this summer? “TWO?! Almiron appears to be your most exciting individual and would be more likely to fit in than most others. Although I must be honest, I haven’t seen enough of him to conclude how he would be – though but he seems to make some quite dynamic and direct runs. “The second player is difficult. Last season I would have said Lascelles as the second and I reckon Dubravka is your best player but still not as good as Pickford. “I’ll take Longstaff as the second, he could have a very bright future ahead of him. He’s played well this season but he needs to kick on and do it over a more prolonged period of time be in the same bracket as Tom Davies or Declan Rice in my opinion. They’ve got more experience in the Premier League andcertainly in the case of Davies has been performing well for 3 seasons now. A big thanks to Will for taking some time this week to speak to us, with him offering some insightful and in-depth answers once again. It sounds like Everton’s big weakness is from set pieces, with Will anything but confident about their chances of keeping a clean sheet. He does seem to think he’ll stop us if they stop Rondon, however, so lively performances from Almiron / Perez, whoever replaces Longstaff and both wing-backs could be key. Next up will be the thoughts of a Bournemouth fan ahead of our trip to the South Coast next weekend. “rim like he’s Messi” that’s a bit cheeky isn’t it? We don’t have the money to buy Walcott and bench him so we appreciate what we have! Wouldn’t it be funny if Almiron had zouma in his pocket all afternoon? Hey Olly, Many thanks for all yor efforts. Love it! Thanks a lot mate! Really appreciate that and chuffed to hear you’ve enjoyed this one!